Our data enrichment services will append Company, or contact details or specific details you might need to your in-house database. The service is designed to help your sales and marketing team grow pipelines, increase close rates and engage prospects effectively. 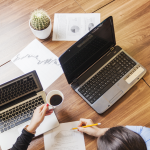 Our data enrichment services give you the actionable insights into sales and marketing processes. 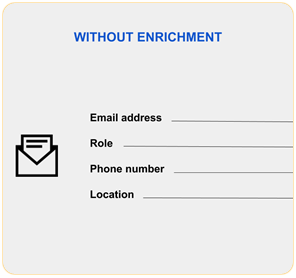 Enriched data will allow you to segment, assign lead scores, identify and contact customers with relevant communications. 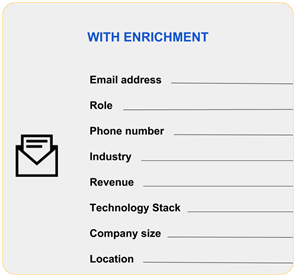 Without data enrichment: Your sales reps take the time and effort all by themselves to research prospect intelligence deviating them from their core job: selling. With data enrichment: Append the best sales intelligence to your database, in the least amount of time. Your database veterans have helped numerous Companies already and can’t wait to do the same for you.